We all think we own the best looking horse in the world, but Stacy Nazario might have a better claim than the rest of us. 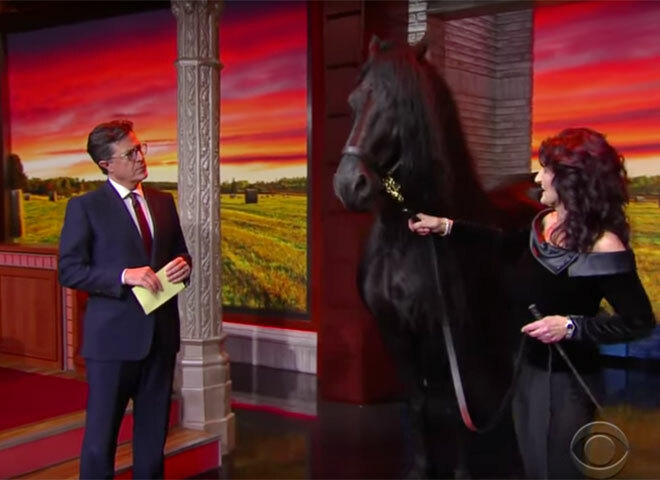 Her Friesian stallion, Frederik the Great, has been named by the internet at large as the “World’s Most Handsome Horse.” That honor earned Frederick an invite to this week’s Central Park Horse Show, and since they were in town, The Late Show host Stephen Colbert invited Nazario and Frederick to be a guest on the show. L-R: Stephen Colbert; Frederik the Great, the World’s Most Handsome Horse; Stacy Nazario. Keep being you, Frederick, and have fun in New York! 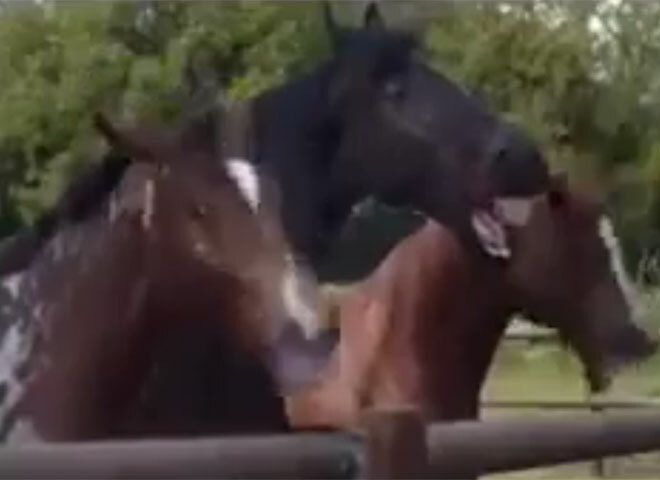 A herd of equine spectators gets a good laugh at a driver’s attempts to back a horse trailer. 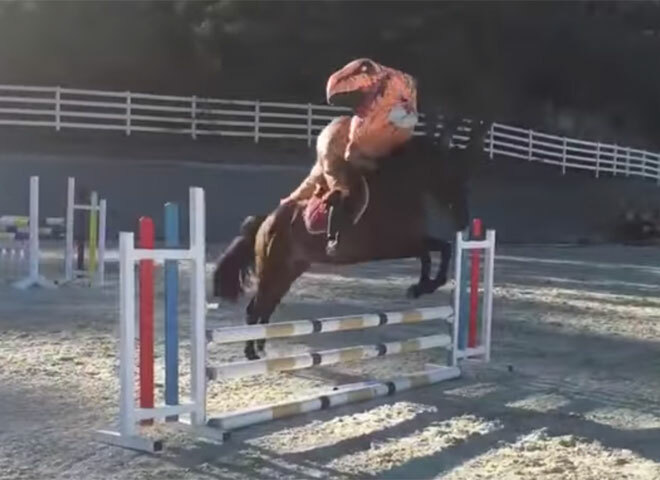 The horse who took this dinosaur for a ride deserves so, so many carrots. 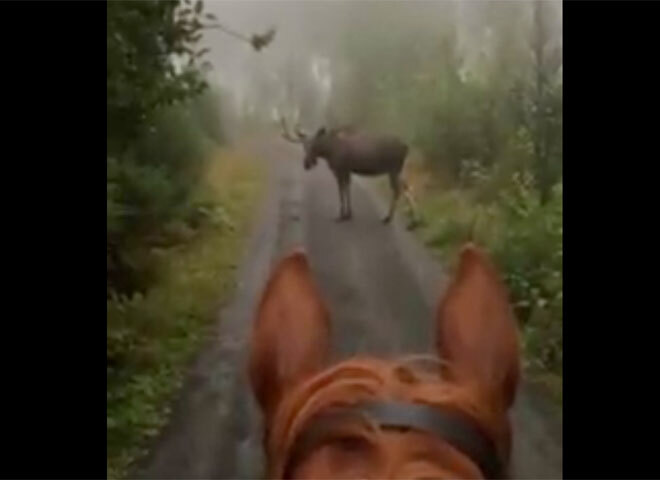 We really don’t talk enough about moose safety. Let’s use this opportunity. 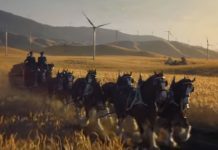 Frederick the Great is just AWESOME! I actually saw it live on the Late Night Show! Knew he was going to be on and stayed up to Watch Him! He’s Beautiful! Love that Forelock, Mane and Tail! This is the first time seeing the James Cordon show one. And I watch that Late Late Night Show also on occasion! Great, and he is a beautiful boy. Love him, I had a Friesian Stallion that I ride upper level dressage and stand at stud. Could be his twin brother! Just gorgeous, Love that mane and forelock! I wonder if he’s ridden in Dressage or is Driven at all? Just beautiful, or handsome in his case! I wonder if he’s a stud yet? OMG he is magnificent! 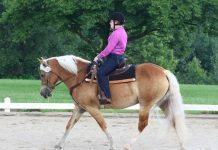 Love this horse! Not so much Stephen!